Three Sisters gardening was an original practice of the northeastern Native Americans. The gardening technique was defined by planting a combination of corn, squash, and beans in the same field (as opposed to monoculture). On the surface alone, the benefits of growing these three crops together was obvious. Semi-climbing beans found the corn stalks to be sufficient support, while bush beans shaded the base of the corn roots, keeping moisture in the soil where it was needed. Squash did the same only over greater distance; the plants vines crawled between the corn mounds, presenting their large, wide leaves to the sun. This not only stopped the hot sun from scorching the earth and stealing moisture, it also discouraged weeds from taking hold. It is said that Native farmers only needed to hoe their gardens up to two or three times in the early summer, thanks to the ground coverage of beans and squash. 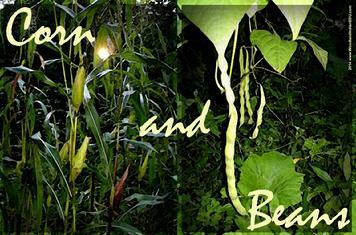 Semi-climbing beans also made a latticework between the four to six corn plants sown in each mound. The bean web worked to strengthen the corn against the damaging effects of strong winds and heavy rains that could bend the vulnerable stalks. Corn cannot prosper without human intervention, and part of that intervention may have included methods of supporting weak stalks with bean vines. The codependent nature of beans and corn did not stop aboveground. Corn needed lots of nitrogen, an element vital to plant cell growth. Beans (legumes) "trapped" nitrogen due to the type of bacteria they host in their roots. When the nitrogen loaded bacteria died, it released its nitrogen into the soil. This is referred to as "nitrogen fixation" - fixation defines the process in which soil bacteria converts atmospheric nitrogen into a stable and biologically usable form. Corn, notorious for draining garden soil of nitrogen, was fed annually a renewing source nitrogen created by bacteria. Combining corn and bean plants extended the life of Native cornfields by not draining the soil of nutrients with the same intensity as monoculture. Combining corn and beans also continued after the growing season, as corn and bean dishes were very popular. In fact, a researcher can hard-pressed to find bean dishes without corn ingredients, though they existed. Iroquois/Haudenosaunee bean dishes included bean soup seasoned with maple sugar, mashed boiled beans, bean pudding (made of ground up dry beans, soaked and cooked to texture, with meat added), beans and squash (cooked beans in the pod served in the shell of boiled squash), and green beans shallow-fried in sunflower oil or bear grease. “Baked beans” likely take their origin from Eastern Native Peoples, one early New England tradition being to “bake” the beans (contained in a pot) in a pit of hot coals... this practice seemingly very Native in practice, it probably is, and it likely influenced the colonial-style baked beans dish. Beans were at times also parched (as was common practice with corn)… this was most likely to rid the beans of any bugs and larva before storage, and to render a pleasant roasted flavor to the dish they were prepared in. But truly, beans was corn’s “other half” – the abundance of dishes made of a combination of both attest to their complimentary relationship in the cooking pot. Soft whole beans were baked in cornbreads, such as “bean bread.” The Cherokee are probably the most well known for baking bean bread, but bean bread was far more widespread among other communities/Nations. Or the dry beans were ground into a meal that was mixed with cornmeal and made into breads, puddings, and liquid baby food. Combining whole kernel corn (or treated corn aka hominy) and beans made a dish referred to as succotash, a Native plural meaning "cooked whole grains." Often meat or squash was added to this combination, rendering a pleasant flavor. While the flavor combination was considered complimentary, the combination had much more than superficial benefits of taste when it came the diet of the Woodland Indian Peoples. The nutritional value of corn and beans were boosted when consumed together, as together they formed a "complete protein." A complete protein is a protein that contains all of the essential amino acids. Complete proteins are found naturally in meats and few plant sources, making the combination of corn and beans crucial in the diets of the corn-based peoples of Native America, including many Native communities in the northeast.